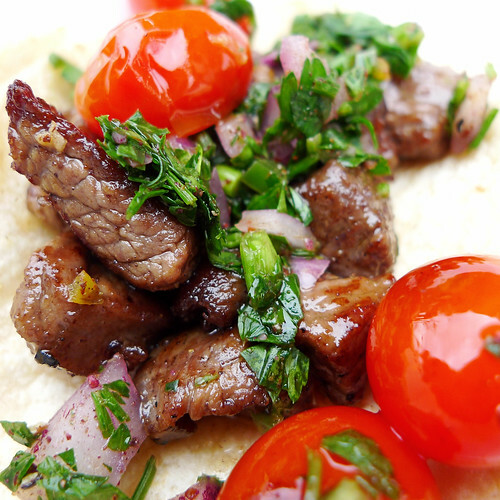 Like Mediterranean food? 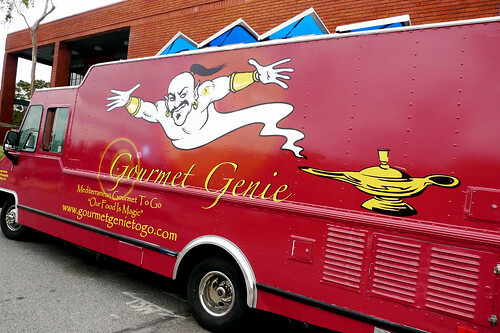 Definitely hit up the Gourmet Genie Truck at this Saturday's Granada Hills Food Truck Fest. I was pleasantly surprised by the Gourmet Genie, not just for the healthy Mediterranean food they serve, but for the enormous portions and great value that comes along with the magic food truck ride. For $14.50 I split Jasmine's Feast Entree, a hefty Chicken Kabob Pita Wrap & Dessert, and left feeling full with leftovers to boot. The Jasmine's Feast ($8) definitely is! The 2 Falafel Patties are crunchy on the outside, yet still buttery moist on the inside, and have a thick creamy, slightly bitter citrus sauce that I can't quite put my lamp-rubbing finger on. The Grape Leaves have a bit of crunch on the outside, are stuffed with Lemony Rice, and are oh-so-good. The dollop of Olive Oil and Paprika on the Hummus make it extra dip-worthy. The Baba Ghanoush is kind of unexpected with a thick yogurt, even cream cheese taste, but my hand model (Evan) loved it.